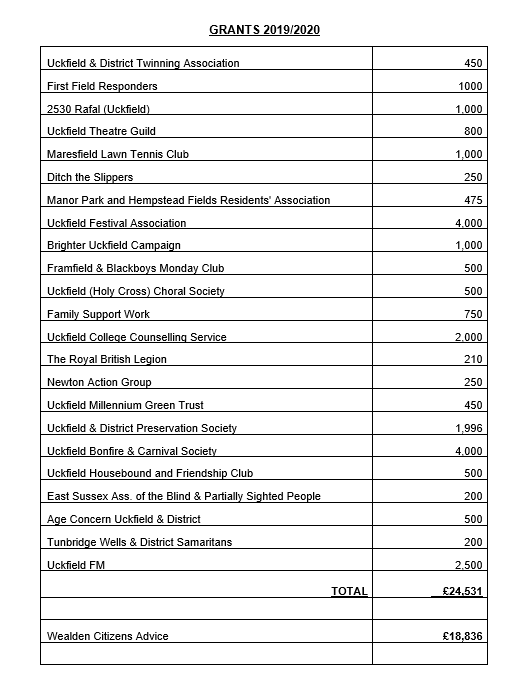 Uckfield Town Council, at its discretion and subject to available funding, provides grants and general support to small local groups promoting community life in Uckfield. Local organisations that fulfil the criteria may apply for a grant from the Town Council for a specific funding purpose. Applications for a Town Council Grant in 2019-20 closed on the 31st August 2018. The Town Council considered the applications received at a meeting of the Finance Sub-Committee on the 12th September 2018. The decision of the Finance Sub-Committee was then ratified by the General Purpose Committee in October. A total of £43,367 will be provided in community grant funding for the period 2019-20; shared between 24 local voluntary groups and organisations.